Watercolour is one of the cheapest, simplest, portable and democratic forms of image making. The paint boxes on display at Tate Britain’s Watercolour show are touchingly simple, familiar to many from childhood. 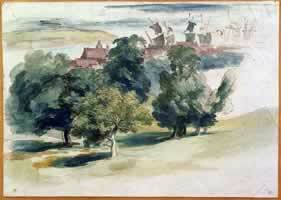 But used by masters, watercolour can capture the most transient and delicate effects and moods. The Tate curators’ grand history sets out to challenge traditional views of watercolour. To this end they have assembled everything from medieval manuscripts to sculpture in plastic, thereby stretching the notion of what a watercolour could be. And, there’s a huge amount to enjoy and pore over in eight thematic-arranged spaces. It opens with the rubric “Intimate Knowledge”. Prayer books from the British Library are brilliantly illuminated in tempera (in which egg protein is used as a binding material) and gold leaf on vellum (calf-hide). They are the first surprise. This is not going to be about what we traditionally understand by watercolour. There is a lovely landscape by Anthony Van Dyck, the sublime Flemish portrait painter, who gave us unforgettable images of Charles I and his courtiers. Again, it is not strictly watercolour, but pen and ink, watercolour and gouache (in which the paint is thickened and made opaque by adding lead or zinc whites). This lively sketch is thought to be the earliest-ever watercolour landscape. It’s a brilliant evocation of trees with lightly-drawn sailing ship masts moving off in the distance. It embodies exactly what makes watercolour so special – composed of a few washes and colours and making use of the untouched surface of paper as an active ingredient. Van Dyck evokes not only a place but a mood. 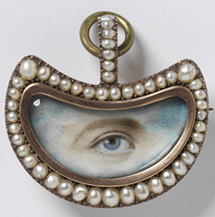 A strange object, the fetishistic Eye Miniature from the mid-18th century, is set amongst an array of tiny paintings by Nicholas Hilliard and other Elizabethan masters. Hilliard’s blues, yellows and golds sing out in a early swagger portrait of George Clifford, Earl of Cumberland in starry armour, framed by the boughs of a stately tree, a distant village glimpsed under the earl’s pike. From portraiture to documenting the natural world, watercolour has long been used to fix on paper and in memory the infinite permutations of the human face, as well as flora and fauna. In this category, the Lion-haired Macaque is outstanding, painted for an East-India company employee in the 1820s. Commissioned to document an exotic species, the unknown Chinese artist has lovingly rendered the monkey’s inquisitive face, soft fur, prehensile feet, sensitively arranging his pictorial space. There are some great views of European town and landscapes from the early 19th century in the “Explorations of Nature” section. John Sell Cotman’s Norwich Market-Place and Thomas Girtin’s White House at Chelsea, painted in “true” watercolour fashion, are outstanding. 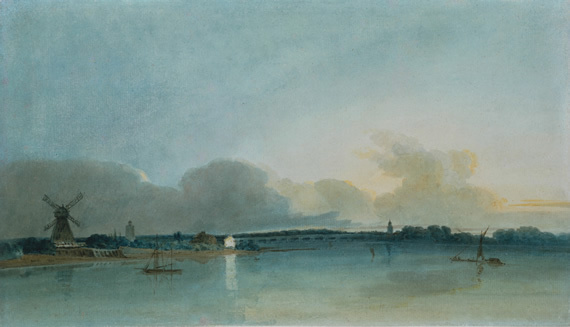 Turner is thought to have adopted a similar motif as Girtin as a tribute to his talented colleague. Girtin died aged only 27. Which brings us to Turner. He is set amongst his peers without undue prominence. 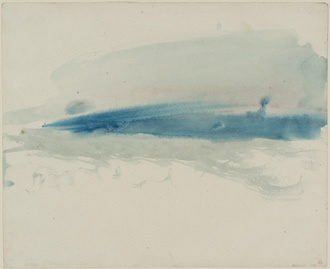 But just the sky studies, sunsets and the 10 sketches from the bequest to the Tate makes this show worthwhile. Turner remains the true master of masters, using the flow of colour and water to move between abstraction and figuration at will. You may want to skip through the cloying “Exhibition Watercolour” section. 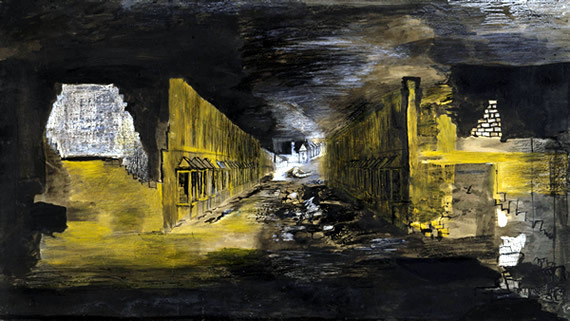 But make sure you see the quintessentially English – and haunting - Vale of the White Horse by Eric Ravilious and Graham Sutherland’s Devastation 1941 – An East End Street. Contemporary notables like Tracey Emin, Peter Doig, Anish Kapoor, Howard Hodgkin and David Austen feature in the final part. It’s fascinating to see their personalities transform the medium – and how, of the wide range of techniques available, it is the simplest, most challenging and revealing. Perhaps the best way to approach this show is not to try and follow the logic of why it has been arranged in the different categories. It’s just too easy to lose the very essence of watercolour – its freedom and immediacy. So what’s not to like about it? Watercolour illustrates a dilemma that so often affects large gallery shows. The curators, quite justifiably, want to present a huge and amorphous subject in a way that provides new insights. But mixing together so many different kinds of subjects and intentions – and too many disparate styles and periods, while it may provide some surprises, can just become too much. It would be as pleasant and instructive, for example, to view Turner’s watercolours or Ruskin’s or Tracey Emin’s on their own rather than in the context of such a big show. It might be more enlightening, for example, to have a series of smaller displays on certain themes, artists or periods, rather than this huge and sometimes jumbly collage which includes some shotgun marriages. But it appears that galleries and museums, especially under the Damocles’ sword of cuts, are driven to blockbusters so that they can justify high admission fees for artworks that mostly belong to the public already. The £12.70 admission charge (£10.90 concessions) is shockingly high. 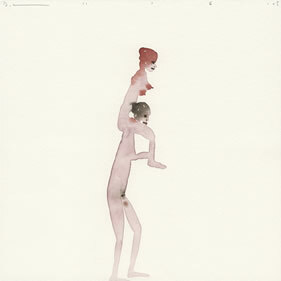 Watercolour is at Tate Britain until 21 August 2011. Open daily.